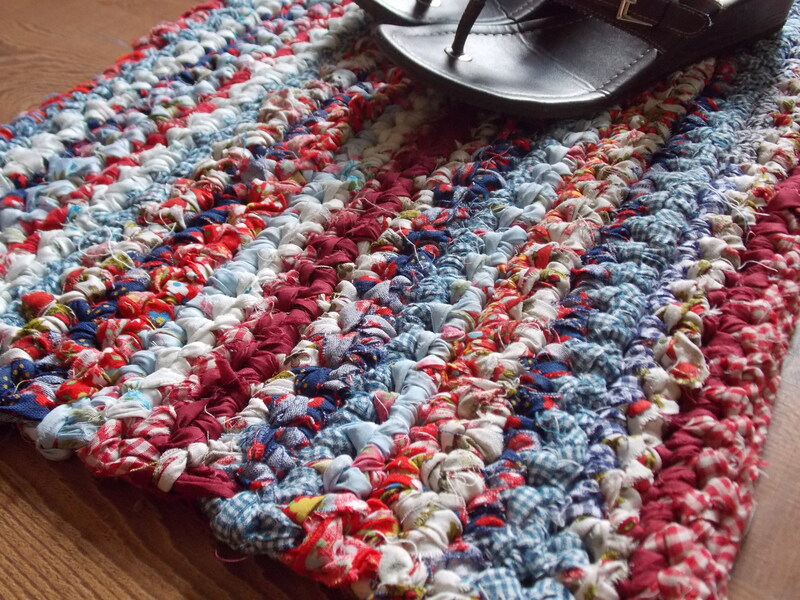 As promised in the previous post, I am now putting on my tutorial for making crocheted rag rugs. I have been enjoying making these and using up some of my fabric stash in the process! 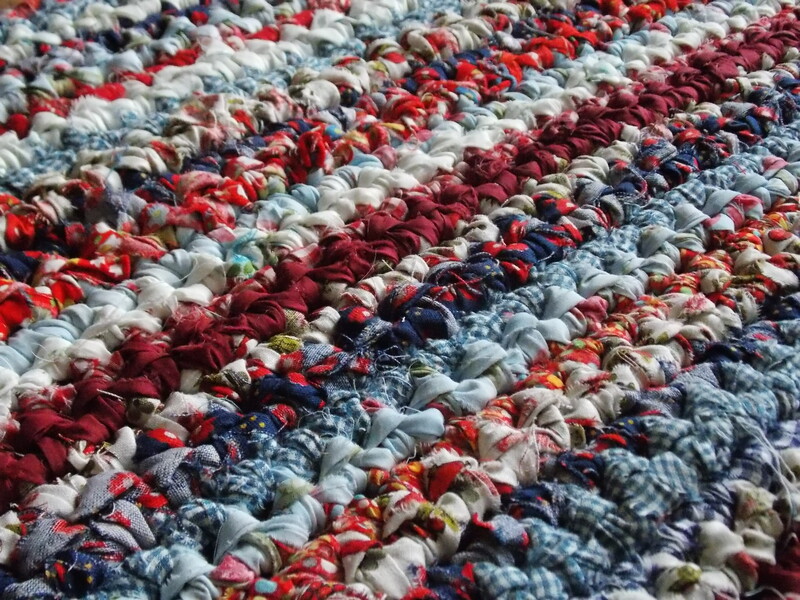 This particular one may be my most favorite yet–a cheery red, white, and blue. The tutorial I am going to explain is for a rectangular shaped rug with stripes of color. To make these, all you need is the following: scissors, a variety of cotton or cotton/poly fabrics, a large crochet hook, and a basic knowledge of crochet. Before you can crochet anything, you need to tear your fabric into strips. I make snips at one end, probably @1 1/2″ apart, then tear down the length of the strip. (A bonus: This is very stress relieving. I LOVE to hear that Rrrripping sound as I tear them!!) I personally don’t do the prep work for all the fabrics at once, just pretty much as I go to do each row. Make a slit at either end of each strip. This is essential when you go to connect two together. 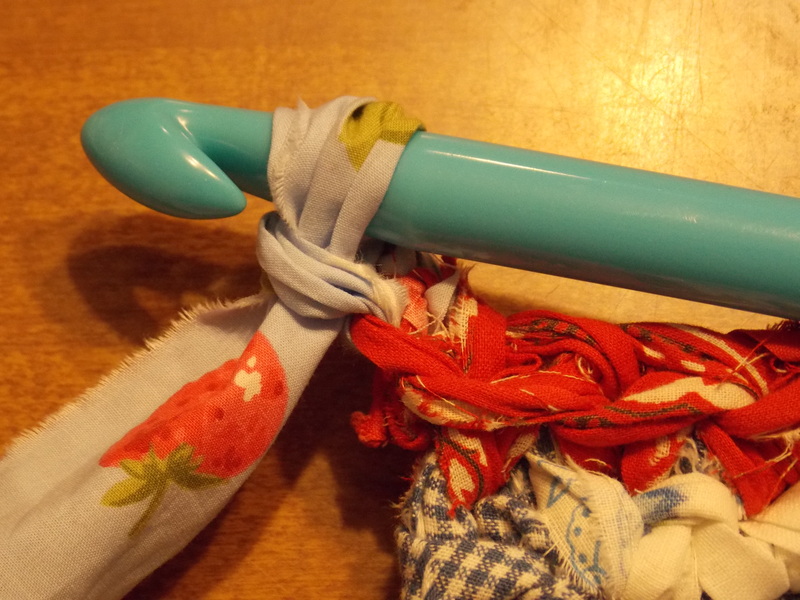 Make a slip knot with the first color you want to use. 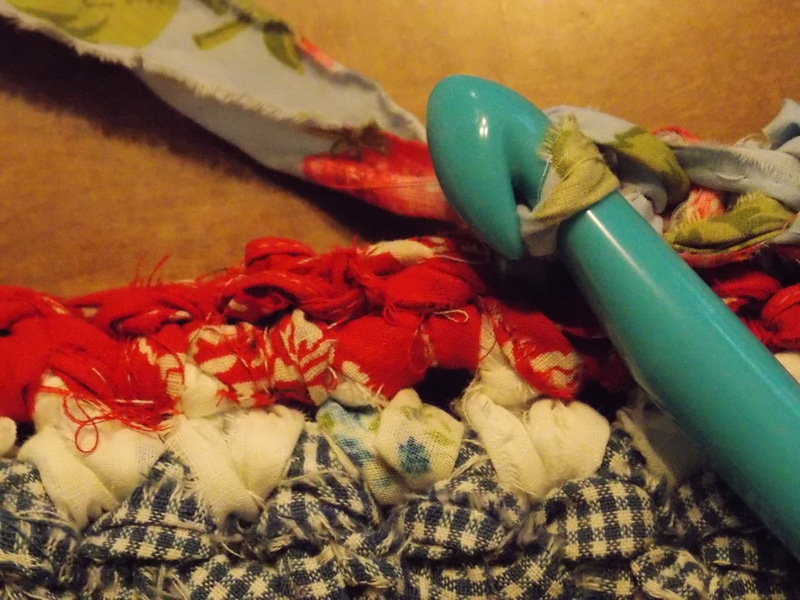 Using your large hook, chain a number of stitches together. 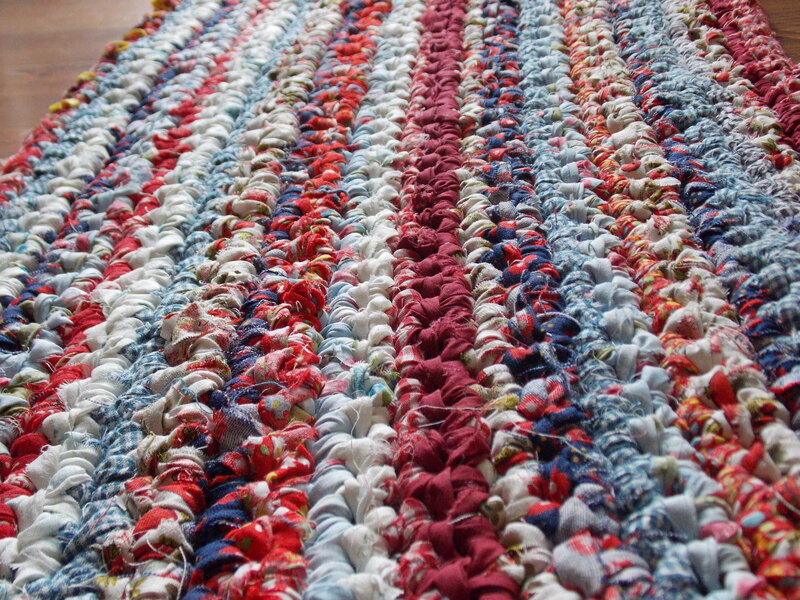 However many you make depends on how long you want your rug to end up being, so this is up to you. 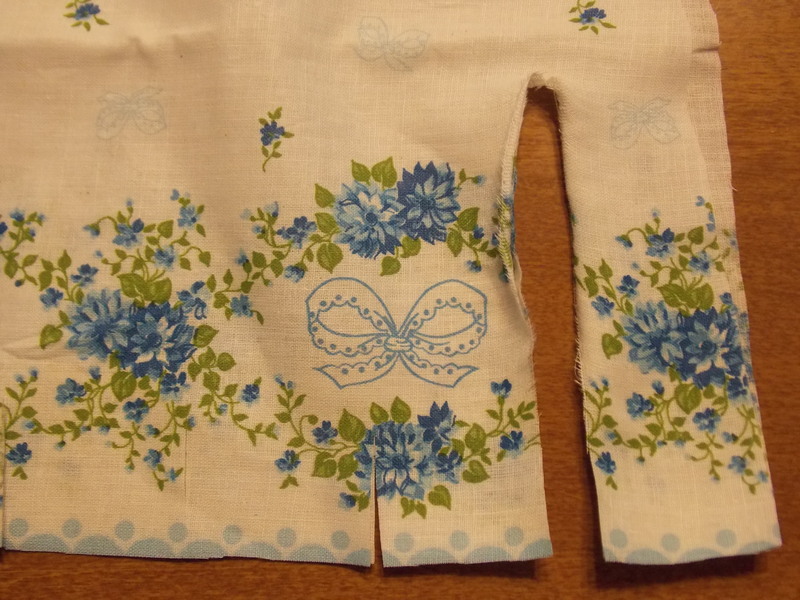 At the end of the first row, connect a new row of fabrics on. Take the new strip and slide one end of it through the slit of the “old” strip, just up about an inch or so. 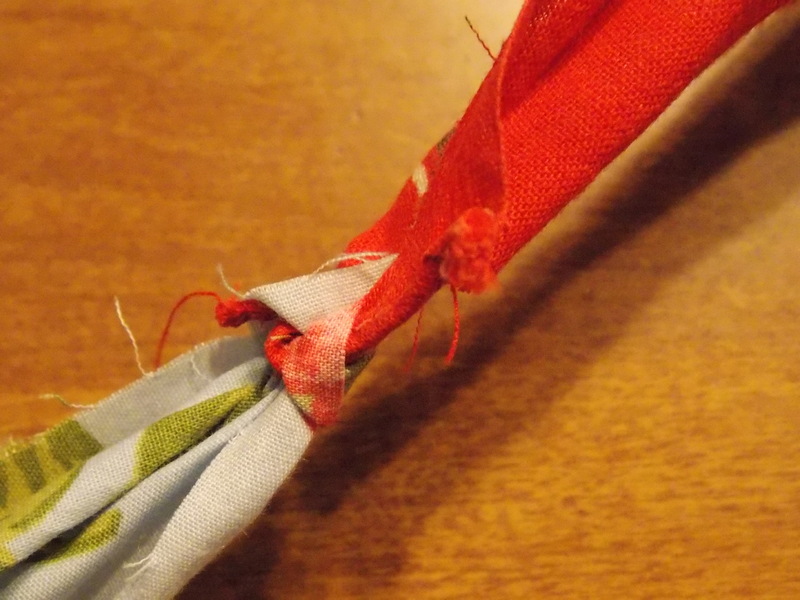 Then pull the tail end of the new strip through that slit of the piece that is sticking up through. I hope to heavens that makes sense. Hopefully you can tell what I’m talking about by my pictures of it. Just so you know, I did a basic single crochet stitch throughout this rug. Remember to chain two at the end of each row, then flip over to start at the right side beginning with the second set of loops. Keep on doing this process until your rug is the size you would like. 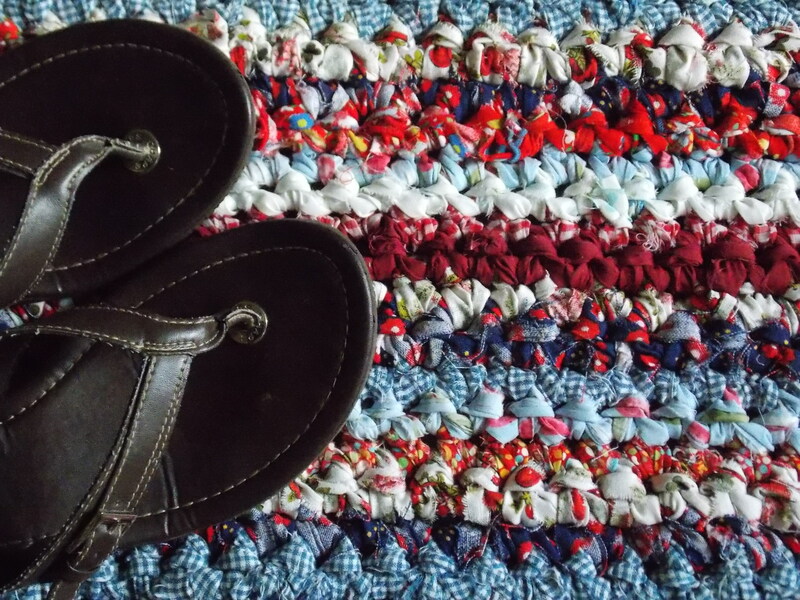 Weave in any ends, step back, and enjoy your handiwork! 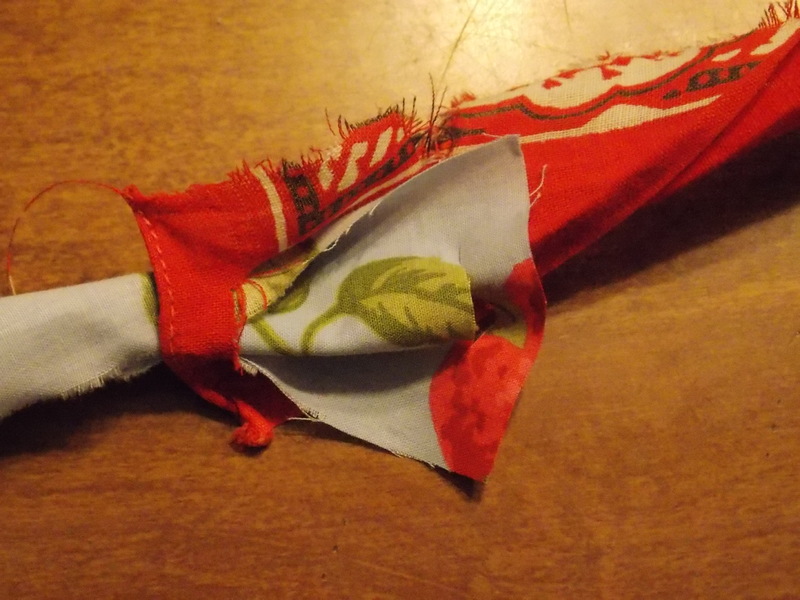 **I will warn you now that this uses up a HECK of a lot of fabric, likely more than you’d guess. I didn’t mind because I had a ton, most of it acquired through yard sales or thrift shops. To me it was a great way to use some up. If you are buying for the purpose of making these, I would recommend buying old sheets and things like that at yard sales. They are easy to work with plus you get a lot of yardage at once for cheap. 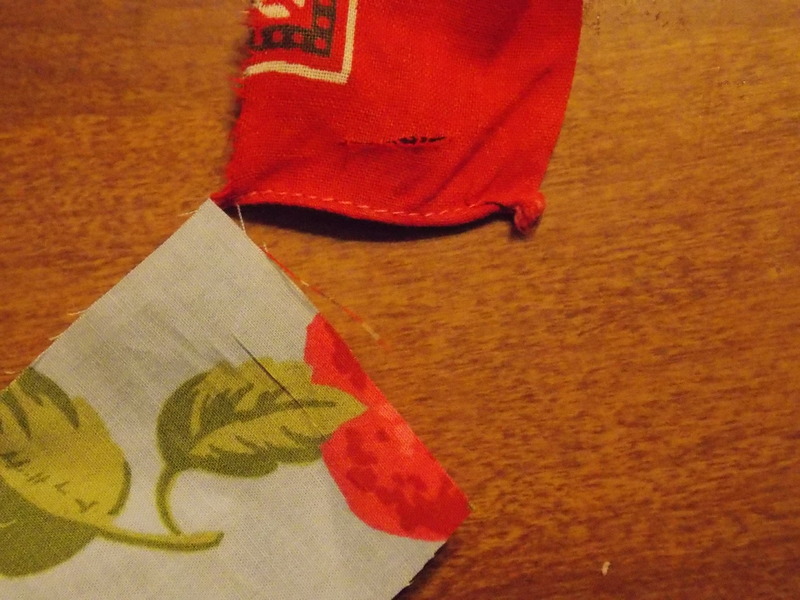 **Also, another little tip: If your fabric is a heavier weight, you need to cut your strips thinner than I showed. (Otherwise it is a bugger to crochet with.) For my denim one I did strips about half the width of these I just pictured. I hope this made sense and if you have any questions, feel free to ask away!